It was a real treat to receive these products all at once. And over the past month, I’ve had a good chance to give them a work-out — from the city to the desert! Here are the details and what I’ve liked (or not liked) about each. Not only is this “Get Started Age Defying Kit” from Andalou Naturals perfect for travel, but it’s a great, low-risk way to try these products. Included are: a cleanser, a mask, a toner, a day cream, and a night cream. You can count on terra20 to have screened their products on your behalf, so it’s really no surprise to learn that Andalou does not use GMO’s, Petrochemicals, Phthalates, Sulfates, Synthetic Colors, Dyes, Fragrances, Triclosan, PEG, MEA, TEA, DEA, or Paraben Preservatives in these products. I love the way the creams absorb so easily and have a very light, fresh fruit scent. The price for this kit of 5 different products is $24 and I already plan to buy the full-sized version of the day and night cream when I get back. I am really enjoying this line. This tinted moisturizer by 100% Pure receives its colouring from fruit and vegetable pigments rather than minerals or synthetic dyes. I’m big on sun protection, so I also like that it offers SPF 20. It’s 100% natural, 100% vegan, and 100% gluten-free. So far, I’m finding that it is perfect for my summer skin but I suspect it will not provide enough concealing effect for my winter skin. It blends it really well and leaves no yucky sunscreen smell (like some other moisturizer/sunscreen combos I’ve tried in the past). 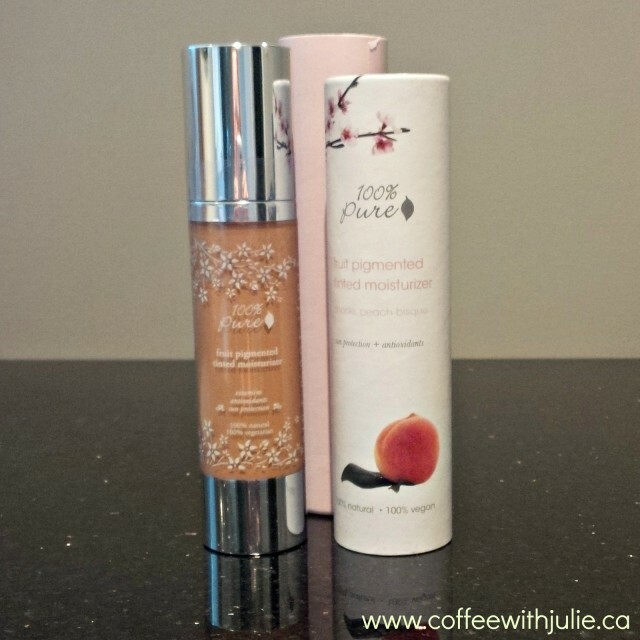 If you already have great skin that needs little to no concealer, this product is for you. Price = $42. 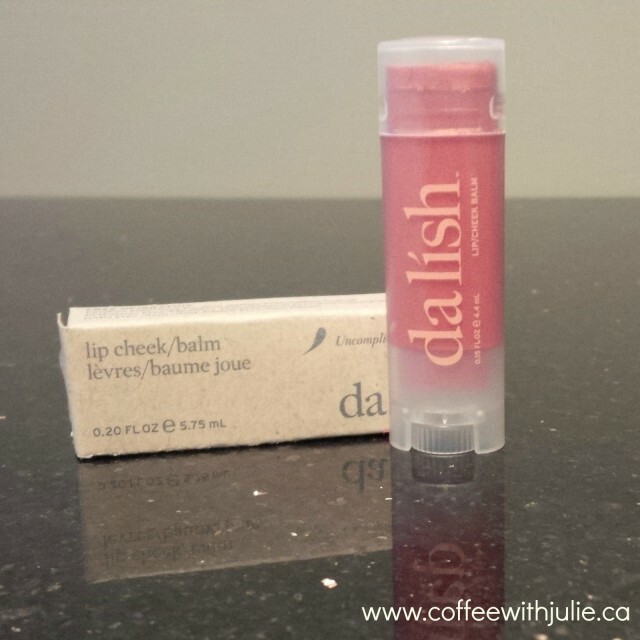 This DaLish Lip and Cheek Balm is so compact (smaller than a lipstick and can easily slide into a front pocket). You just apply it directly to your lips for lip colour and then blend it into your cheeks for some blusher. I’ve always been a bit sceptical about these kinds of “all in one” products, but I have to admit that it really is handy. The colour I have is a bit too orange-y for me, but I think I could start to use this product regularly in the right colour. And at $10, I’m up for trying a couple of different shades. I’ve been terribly attached to Dior Show mascara for a number of years now. It ain’t cheap, but my mom has been sweet enough to spoil me with duty-free treats when she returns from her business trips. 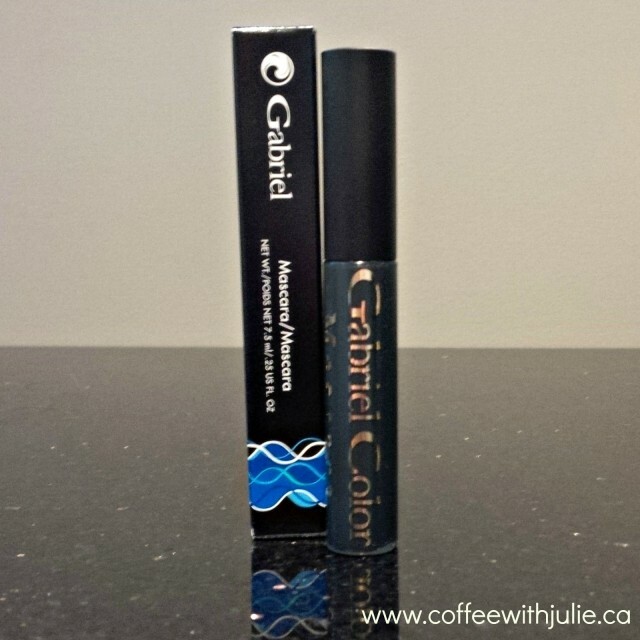 So, really, I was not in a big rush to switch from Dior to a terra20 brand, but I gave it a go with Gabriel mascara in black and Gabriel liner in chocolate brown. And … well … I love them both! The mascara is a lengthener (as opposed to thickener) and goes on easily with no clumping and a great, sleek shiny colour. As for the eye liner, it’s that perfect type that’s not too hard or too soft. I’ve been using it on my upper eye lids and for my barely-there eyebrows. I’m a convert! The price for the mascara is $25, while the liner is $20. All of the above drop right into a great looking Danica Studio cosmetics bag with a seriously cute little squirrel on it, while still leaving me with loads of room for deodorant, hair elastics, and some travel size shampoo and conditioners! P.S. Looking for any other tips for switching to safer cosmetics? You can find all my posts on this topic right here. I don’t really wear much makeup but I do on special occasions (nights out, weddings, etc…). I really would prefer to use safer makeup even if they cost more. This is a great starting list for me. Thanks for sharing! I agree – I’d rather pay a little extra for quality ingredients that have been screened for safety. But I have been really pleasantly surprised to see the full range of cosmetics available in terra20 … just like a mainstream store, there are the entry-price lines of products all the way up to the luxury lines. Sadly I have nothing to share…my make up bag consists of…well…it needs some serious help! lol Great post, Julie! I love, love, love Terra20 and these products you mention sound fab. My favourite thing is that you also mention what you don’t like about the products…because not everything suits everyone. Thanks so much for this feedback, Sandy. I, too, enjoy reading pros *and* cons in a review. Yes, tinted moisterizer is a beautiful thing! I like that delish lip and eye colour, I’ve never seen makeup thats 2 in 1. Delish is really pretty cool … check out their website and see how they really work to simplify the notion of makeup. But I don’t use it as eye colour … I use it as a blush. I dab some along my cheek bones and then just rub it in with my fingers. What a great line up! I have never heard of these products before but they sound great! I love the lip an cheek balm! What a great idea! Anything to simplify the morning rush, right? 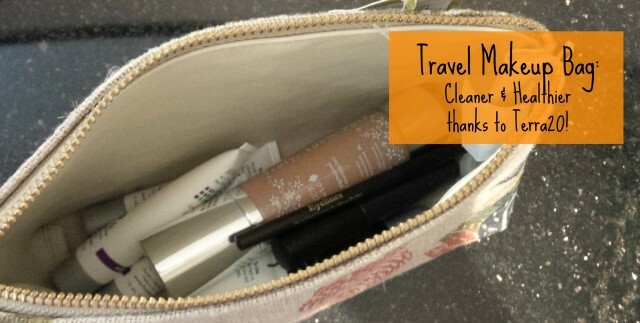 For me, it’s particularly handy in a purse since I am a pale gal … I can dab on a touch-up during the day in a pinch. Interesting. I was happy when I found this post in my feed today. I haven’t tried these ones ever and I always look forward to your smart take on smart eco friendly items and cosmetics. I am a massive lover of Aveeno facial products with SPF in them because I know I get great skin coverage on my face all the time. I need a new night time moisturizer again though so maybe I will take a look at Terra 20. Thanks. Looks like a wonderful group of cosmetics. Love that they are all natural. I have a lot of environmental allergies so I have to use makeup that is hypoallergenic and natural. I will have to give these a try! Funny you mention allergies … I took my friend with allergies to Terra20 and she literally had tears in her eyes because she’d been struggling for so long just to find everyday products that wouldn’t cause her skin to break and blister! I know you’re not in Ottawa Kerrie, so try the online shopping option.